In the wake of Hurricane Sandy, Occupy Wall Street has occupied itself with a humanitarian effort: getting supplies to the victims of the storm. And you don’t have to be in New York to help. 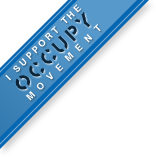 Occupy has launched online “wedding registries” on Amazon.com so people wishing to give aid can contribute from anywhere. Anyone can purchase a gift from the Sandy Registries, which include fleece blankets, coolers, extension cords, flashlights, trash bags, diapers, and even clothing items like socks and underwear. The items on the New York registry are shipped to the Brooklyn chapter of Occupy’s Sandy relief operation at the Church of St. Luke and St. Matthew in Clinton Hill, where they will be taken to those in need. Gifts from the New Jersey registry are sent to Occupy’s outpost at Barrow Mansion in Jersey City. Looks like the NYDN has joined the ranks of Occupy’s fans. Hey, well, better late than never.